As UWM’s spring break approaches, I hope you have enjoyable time planned, even if it’s just a change from your usual schedule and routine. Today, I write to share the latest news on Wisconsin’s 2019-21 biennial and capital budget processes. A proposal to allow undocumented Wisconsin residents to pay resident UWS tuition rates. The Governor’s proposal also eliminates performance base funding programs, which were implemented in the 2017-19 state operating budget and provided $27.5M annually to UWS. The Governor’s biennial budget proposal is available here. The Legislature now begins its review of the proposal, with public hearings conducted by the Joint Finance Committee and, eventually, a full debate in both the State Assembly and State Senate this spring. The compensation plan proposal requires an additional approval from the Joint Committee on Employment Relations. Today, the Governor supported the following UWM building and renovation projects in his recommended 2019-21 state capital budget. $7M for an annex to the Klotsche Center to improve student recreation and sports offerings. The chemistry building would be paid with state tax dollars. The union and Klotsche annex projects are funded through segregated fees that are already being collected. Neither project will result in future increases to student segregated fees. We are extremely pleased with the Governor’s recommendations, which will significantly enhance student experiences in STEM fields, socially and in recreation. The Governor’s proposed capital budget is available here. Similar to the operating budget, the capital budget will now be reviewed and debated by the Legislature. Our State Budget Information web site has many resources and I encourage you to check it regularly for the latest news and updates. As you engage in the budget process, please remember to use personal resources including non-work time, noting the UW System rules regarding engaging in political activity. The coming weeks and months will provide opportunities to learn details about how the various components of the proposal will affect UWM. There are likely to be changes to this proposal as it progresses through the legislative process. Overall, I am pleased with Governor Evers’ plan for additional funding, including the compensation plan. This direction is consistent with what we have been requesting and what will benefit our students, faculty and staff and the state of Wisconsin. 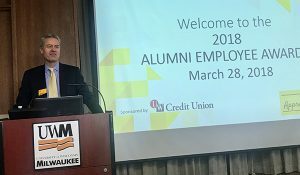 Thank you for your interest in the budget process and your contributions to UWM, which help us tell our story of why we are deserving of investment and how such funding yields significant dividends for our students, the region, state and beyond.